Pan, that naughty nature deity of Classical Greek mythology, was not only popular in the art of that time but throughout western art history. Synrinx. 2018. Jesse Mockrin. Oil on Linen. Courtesy of Night Gallery. 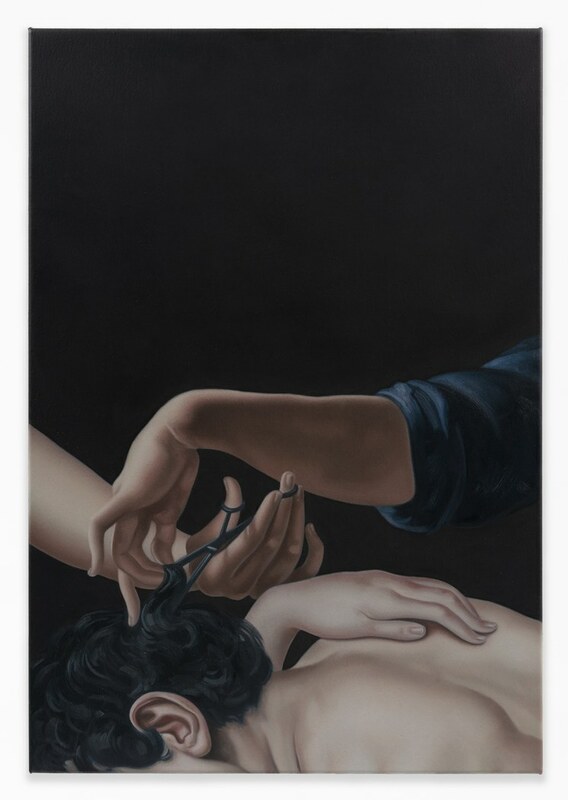 Jesse Mockrin reinterprets one of those Pan stories in a jarringly contemporary way in her show, titled Syrinx, at Night Gallery downtown. With an astonishing command of the realist methods of 17th and 18th century European art, Mockrin depicts a scene from Ovid’s Metamorphosis. Syrinx is the wood nymph whose appeal so enraptured Pan that he chased her until she came to a river where water nymphs came to her aid by transforming her into a bundle of reeds. Unwilling to give her up, Pan then gathered the reeds and created the first pan pipes. 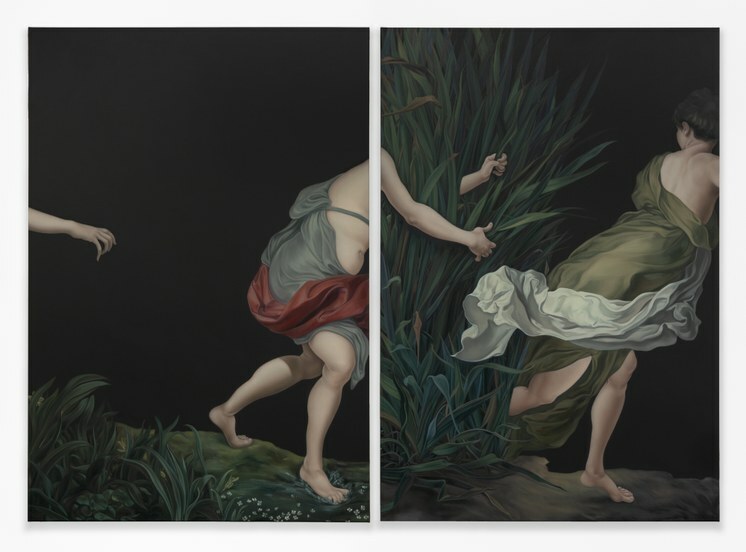 In this show, Mockrin based her diptych Syrinx (2018) on two earlier versions of the tale, one by 17th-century Dutch master Peter Paul Rubens and the other by 18th-century French artist Noel-Nicholas Coypel. Mockrin copied parts of specific figures and gestures from each of those works and presented them on matte black backgrounds. Two large panels, hung only an inch apart, appear to be a single painting but in fact document a continuity of interest by two artists over the course of a century. More important in this context, they illustrate a distressingly lengthy acceptance of the tale of a man chasing and violating a woman who is clearly trying to evade capture. Abduction. 2018. Jesse Mockrin. Oil on Linen. Courtesy of Night Gallery. In Mockrin’s diptych, the woman is running but no Pan is in sight so there is only the suggestion of events unfolding. 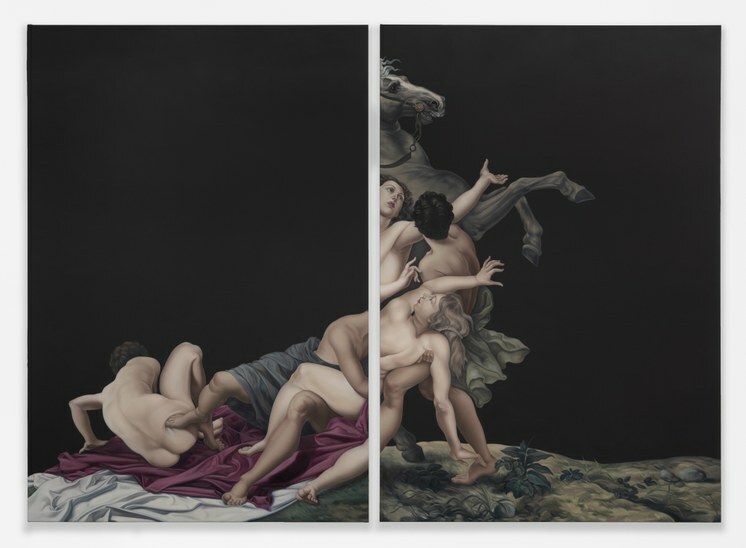 Similarly, another of her dark diptychs, titled Abduction (2018) also visits a familiar theme of art history with barely clothed women in distress about to be carried away on horseback. The rearing beast, the pleading faces of the women, the limbs and bodies of pale, pink tinged flesh. 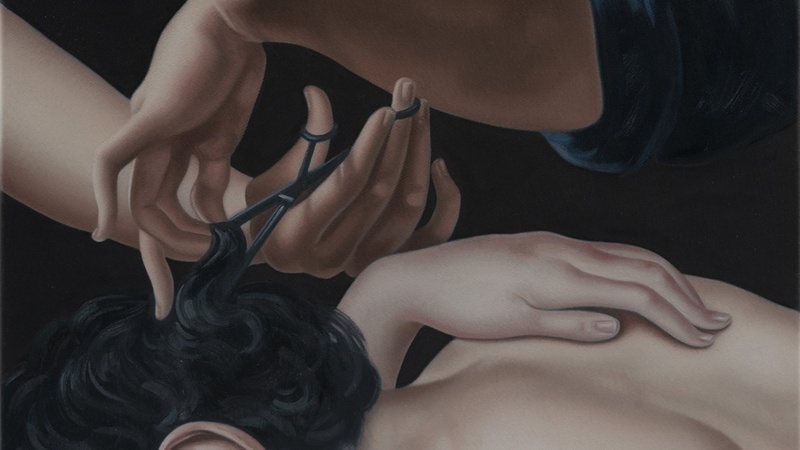 Mockrin retains the enticing surface appeal of earlier painting techniques but she crops and reorganizes the pictures as a narrative critique. Some Unknown Power. 2018. Jesse Mockrin. Oil on Linen. Courtesy of Night Gallery. Balancing the cycles of history paintings are a number of smaller pictures of a symbolic details such as female hands with long, curving fingers handling the hilt and blade of a gleaming sword or cutting a lock of hair, references to the role of female power and its problematic representation by men throughout the ages. The impact of Mockrin’s message is the greater for being so exquisitely painted. Her subtlety of color and brush handling is far from common these days. Much contemporary realism is based in photography, which was Mockrin’s initial practice as an artist. Avoiding slavish photo-realism or heavy-handed recreation, Mockrin’s ambitious paintings use their beauty for a reshuffling of art historical views and as well as social and political observation. The show is on view through Jan. 19. Taylor Mac's Holiday Sauce. Photo credit: Little Fang Photography. But what about Christmas glee? 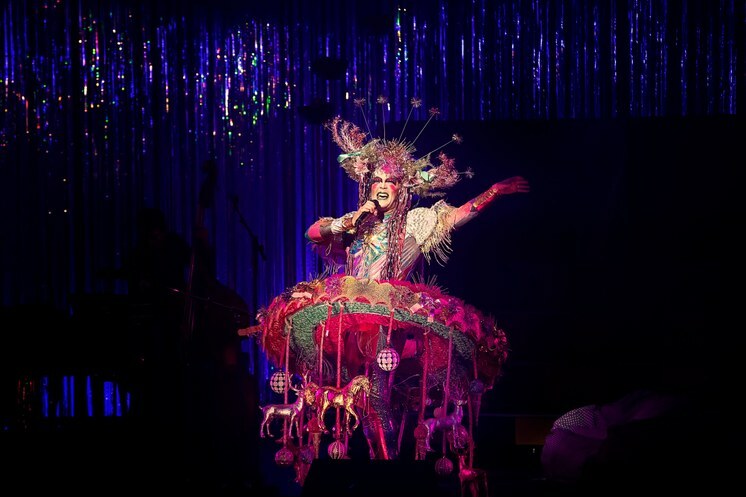 Fear not, we have the return of Taylor Mac, the MacArthur genius grantee who melds Broadway bravado with drag queen sass, along with music director Matt Ray and costumier Machine Dazzle. Last spring, Mac performed his epic 24-Decade History of Popular Music. This time, it’s Holiday Sauce, his riff on Christmas tunes and much else we find adorably annoying. Sure to be Fabulous with a capital F. Go early to enjoy the Saucy Sweater Pop-Up or stay late for the Sexual Consent Santa Station. At UCLA’s Royce Hall this weekend, Dec. 14 and 15.